By now you’re probably aware that Congress is hard at work on a tax reform plan. The Tax Cuts & Jobs Act is our plan to improve our tax code so that Americans can keep more of their paycheck and businesses can be on a level playing field. Did you know that the American middle class is smaller today than what it was in 1990? Or that the middle class makes just about the same salary today as they did in 1990? I think this is unacceptable and that we’ve got to do so much better. And we can do better. That’s what our Tax Cuts & Jobs Act does. A recent analysis by non-partisan Tax Foundation found that the Tax Cuts & Jobs Act will add an estimated 975,000 new full-time jobs to the American economy and increase after tax income by 4.4 percent for median households. In South Carolina it will bring an estimated 13,850 jobs and provide a $2,391 gain in after tax income for middle income families. This week the Ways & Means Committee analyzed the bill and passed it out of committee, setting it up for a vote by the full House of Representatives next week. As a member of the Ways & Means Committee I've had a seat at the table for this important bill. I'm proud of what we've accomplished so far and am looking forward to passing this bill to provide relief for Americans. There’s a lot of information out there about this bill, some of which are outright false and some of which are misconceptions. Here are some commonly asked questions that I hope can provide clarity on what our bill does and doesn’t do. Isn’t this bill just a tax cut for the wealthy? No. The Tax Cuts & Jobs Act delivers tax relief at every income level – while maintaining the top 39.6% tax rate on high-income earners. It lowers tax rates on low- and middle-income Americans and significantly increases the standard deduction, which means hardworking Americans can immediately take home more of their paychecks. Is it true that 80% of the tax breaks go to the wealthiest 1% of Americans? This is simply false. Under this bill, the highest earners will continue to face the highest tax rates and pay the most taxes – in both dollar and percentage terms – of any Americans. In fact, our legislation eliminates dozens of costly and complex loopholes and special deals that have historically benefited wealthier Americans the most – precisely so we can reduce tax burdens at every income level. I heard this bill actually raises taxes on the poor. That's untrue. This bill delivers crucial tax relief for low-income Americans. The Tax Cuts & Jobs Act significantly lowers the tax burden for low-income Americans by roughly doubling the size of the standard deduction. That means more of each paycheck will be protected from taxes – from $6,350 to $12,000 for individuals and $12,700 to $24,000 for married couples each year. I heard this bill is an attack on the middle-class. The Tax Cuts & Jobs Act is a direct and immediate boost for middle-income Americans who have been struggling to get by, let alone get ahead, under today’s broken tax code. It reduces the tax rates for low- and middle-income Americans, and roughly doubles the standard deduction –protecting up to $24,000 of your family’s take-home pay each year from taxes. With this legislation, middle-income families will get to keep more of the money they earn for what matters to them rather than sending it to the Internal Revenue Service. For example, a typical family of four earning $59,000 (the median household income) will receive a $1,182 tax cut. On top of that, because of the historic tax relief for our businesses, this bill will create jobs and increase paychecks so Americans can finally earn a raise after a decade of stagnant wage growth. That’s real money that middle-income Americans can save, spend, and invest how they want. Won’t changing the state and local tax deduction raise taxes on middle income families? By eliminating costly deductions that artificially raise taxes, our legislation is able to reduce the tax burden for Americans of all walks of life – regardless of where they live or whether they itemize their taxes. Our bill lowers tax rates, roughly doubles the standard deduction, allows families to deduct state and local property taxes, repeals the Alternative Minimum Tax, and enhances tax benefits to help families buy a home, raise children, and send their kids to college. Since this bill eliminates the personal exemption, won't that increases taxes on families? The Tax Cuts & Jobs Act takes several bold steps to deliver relief for families. First, our legislation helps families keep more of their paychecks by roughly doubling the size of the standard deduction and lowering tax rates. This bill establishes a new Family Credit – which includes expanding the Child Tax Credit from $1,000 to $1,600 to help parents with the cost of raising children, and providing a credit of $300 for each parent and non-child dependent to help all families with their everyday expenses. It also preserves the Child & Dependent Care Tax Credit so families don’t have to choose between earning a paycheck and taking care of their children and older dependents such as a disabled grandparent who may need additional support. Our legislation also simplifies the tax code so that nine out of ten Americans will be able to file their taxes on a form so simple it could fit on a postcard – saving families money as well as precious time and aggravation that today accompanies tax time. A full analysis of our bill, more frequently asked questions, and the bill text are available here. 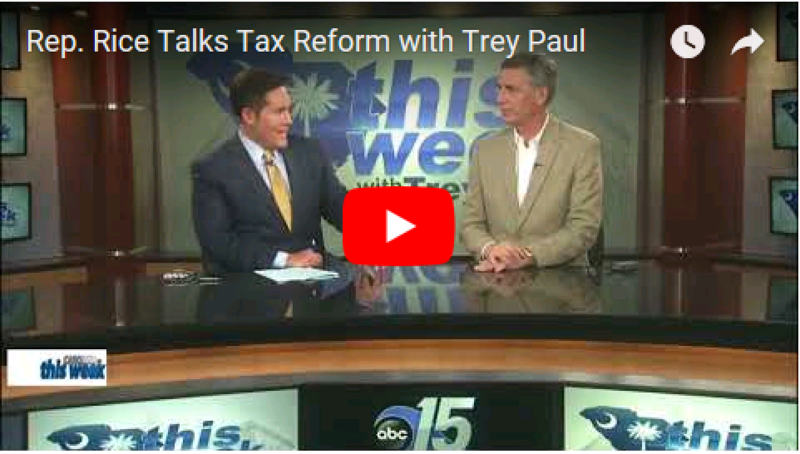 You can also watch me talk with Trey Paul about our tax bill and how it will help families and businesses in South Carolina below!